A while ago I released a bypass for the webkit XSSAuditor in Chrome, I thought I'd honor it with a blog post and discuss another danger the XSSAuditor presents to web application security. This 'danger' of XSS filters has been published in a very popular paper---http://www.collinjackson.com/research/xssauditor.pdf--- about some XSS filters. What I'm doing here is demonstrating whats described. 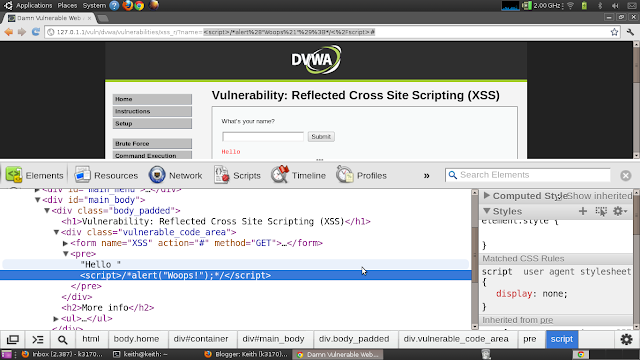 XSSAuditor is part of WebKit's HTML parser and exists to try and mitigate reflected XSS attacks. Unfortunately because of how the auditor operates it can often have quite the opposite effect! In this post I'll explain the situations where XSSAuditor can actually have the adverse effect on a web application's protection against XSS attacks. Before getting down to business we need to cover a little admin, I should first make it clear exactly how the XSSAuditor goes about its job. I'm sure some of you will immediately start thinking of ways you can inject one thing while being returned another. Sit tight I'll get to instances where that's possible! So lets take a look at the XSSAuditor in action, what it does and when. Once again I'll be using DVWA to do the demo. So in the above screen shot you can see the effect XSSAuditor has on the injection payload. 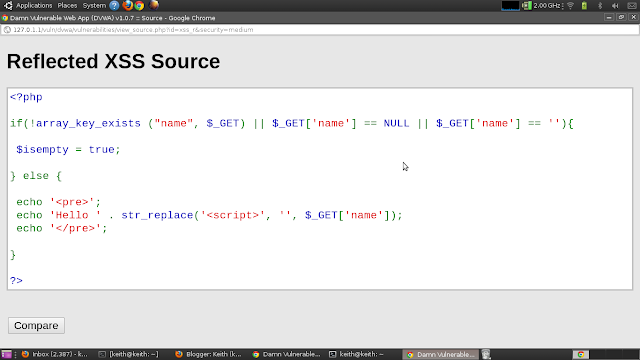 Its managed to match the payload in BOTH the request and response and is stripped out the contents of the script tag. You may wonder why it doesn't just completely kill the entire payload, why would it keep the script tags? Oh yes, why keep the script tags? This is done so that the Auditor affects as little of your browsing experience as possible, it will only remove what it deems dangerous, but keep the rest of the returned HTML tokens in attribute values in case the Web Page needs them for some reason. Personally I don't agree with this stance, browsing safety trumps browsing experience anyday! So now you guys know a lil about what the auditor does, I can move onto explaining what it doesn't do! before it reaches the browser the XSSAuditor would touch it. I'm talking about cases when the web application you're attacking mangles or changes the payload before returning it. This particularly dangerous when the application returns the payload in a form thats different from it is in the request but still runnable. Now I know that this doesn't likely occur in modern applications, I've stated it this way because it provides a good stepping stone to move onto the next topic. I must make myself clear when I say "Server Side XSS filters", I'm referring to server side filters that strip out dangerous payloads from requests before returning them. Because of the way the XSSAuditor operates, its possible to use these server side filters to propagate XSS attacks! If you think about it a lil it because pretty obvious. XSSAuditor tries to match A with A - q, this fails and the returned payload is left untouched! if you inject a payload and the server removes all the good bits, why would it still be dangerous in the request? To prove that we can create attacks using these properties, I'll pose a not so hypothetical situation. This means it will not find a match between the two, and leave the response to be parsed by the WebCore. This example is quite simplistic though I'm confident that code like this does occur in the some of the web applications out there---I know you haz em! Another thing to take into account is the average blacklist or regex that is to perform a similar action---remove dangerous string tokens from input---will most probably try to match a list of tags, not just <script>, unless the developer knows absolutely nothing about XSS attacks. As expected! Also keep in mind that we are not just talking about Server Side filters only here, we could be talking about IDS's or WAFs I'm sure some of you will be able to think up tons of examples where applications behave the same way. The most shocking part about all this is the XSSAuditor is supposed to protect users but what It's doing here is actually helping propagate attacks! Solution? That's it for now! Hope you enjoyed it, feel free to flame me with some comments if the post has some spelling/logic or grammatical errors lols. Interesting post, thanks for your research. I would however prefer if you could elaborate on "XSSAuditor is supposed to protect users but what It's doing here is actually helping propagate attacks!". 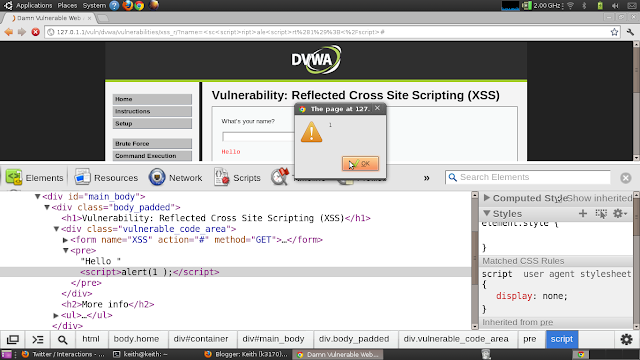 I have to disagree, in what way does it encourage XSS? The XSSSAuditor does everything it is supposed to do, it is the website's responsibility to make sure that all user submitted content is sanitized properly. thanks for the comment. good question. oh yes when I say "helping propagate" I mean the way it operates helps the effectiveness of a reflected attack, so much so that where XSS is impossible--- in some cases---it now becomes possible. I agree that websites should protect against XSS, and the above website does! though this is a simplistic example of XSS protection many websites employ the same train of thought:"HTML tags are bad input I must remove them before echoing my output" and this does work in many cases. The problem is that the XSSAuditor is trying to do the same thing, and because of the way it is trying to this It's possible to turn what XSSAuditor purports to be a protection, into a weakness, in effect the website's protection also means nothing, because of the auditor. Chromes users at the moment believe that because the XSSAUDITOR is sitting in their html parsers, they don't need to worry about reflected XSS, which---in any social engineers mind---creates the perfect trust vulnerability---helping the effectiveness of attacks----. If we can get users to believe one falsehood---actually two if the websites promises to be safe---we can use it to imply belief in more! So in summary 1: it helps propagate attacks because it turns website protection against the user and 2: helps people believe that they cannot suffer from these attacks. Thanks for that quick reply, thanks for the explanation. You made it very clear! Keep posts like these coming.